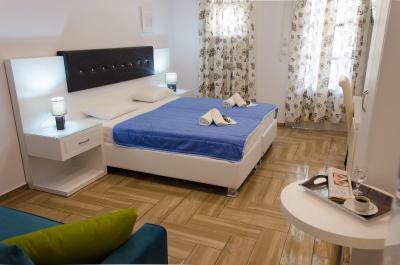 Lock in a great price for Polykratis Rooms – rated 8.6 by recent guests! 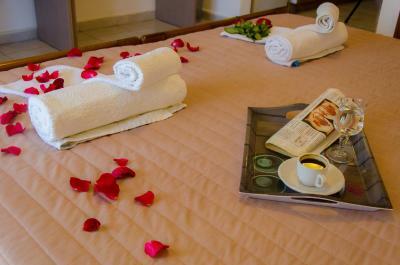 Polykratis Rooms are ideal for those wanting to do things under their own steam. It's perfectly located at the end of the 'strip' in Skiathos Town and is about a 5 minute walk to the port. There's a great bakery across the road for breakfast, the staff were brilliant and we even got a lift to the airport which was very welcome (the lift, not the going home!). Would recommend and would definitely use again. 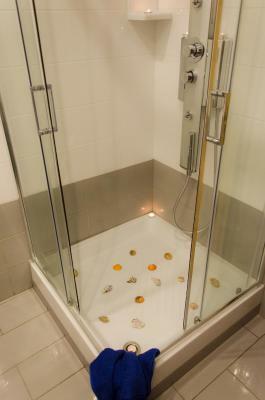 Power shower and memory foam beds! Cleaning every day (even Sunday) with fresh towels every day and bedding every other day. Bottle of wine on arrival and courtesy lift to airport for return flight. 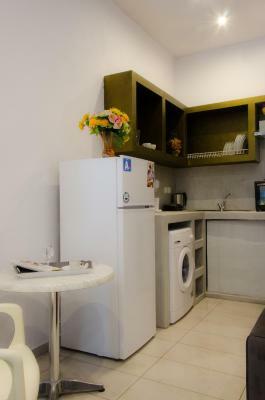 Great place, very clean and excellent location (center but still quiet). 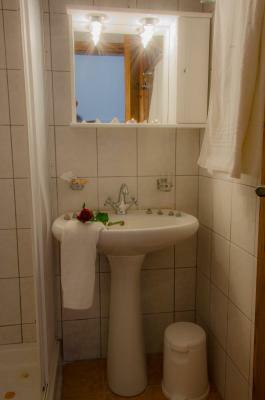 Host is very kind and helpful but not pushy and rooms are cleaned every day. Value for the money is excellent ! Owners are really nice and helpful! Even picked us to the airport in the end for free. Thank you! Clean and spacious apartment. Close to the main street and bus stop. Very friendly and nice staff. Kitchen bathroom and bed all great, very close to Main Street so the location was excellent for the town. Friendly and accommodating owner. Nice people, trying to be helpful all the time. Large parking next to the building. Clean room. Walking distance from the port and 10 meters from the pedestrian area. Posizione centrale, pulizia, massima accoglienza e disponibilità. Skiathos è bellissima e se dovessi tornarci sicuramente tornerei in questa struttura. Grazie di tutto ! Ottimo soggiorno, posizione strategica 2 minuti dal centro di Skiatos, stanza molto ampia, carina e pulita. Il titolare con la moglie simpatici e cordiali! One of our best sellers in Skiathos! Located in Skiathos Town, 1,650 feet from Papadiamantis House, Polykratis Rooms features a restaurant and free WiFi throughout the property. Rooms have a flat-screen TV. Certain units feature views of the mountains or city. 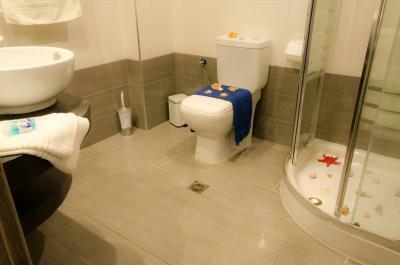 Rooms come with a private bathroom equipped with a hot tub. Skiathos' Port is 1,650 feet from Polykratis Rooms, while Papadiamantis' House is 1,950 feet away. 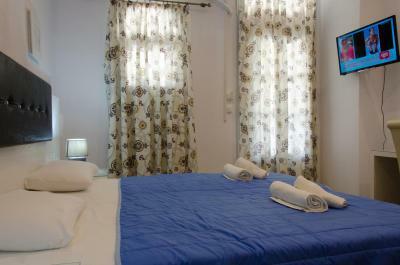 The nearest airport is Skiathos Airport, 1.2 mi from Polykratis Rooms. 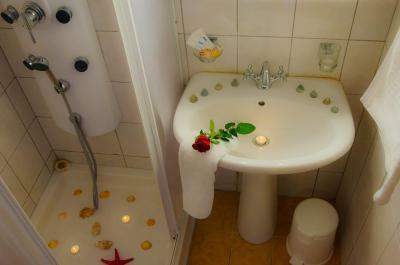 뀐 Located in the top-rated area in Skiathos, this property has an excellent location score of 9.4! 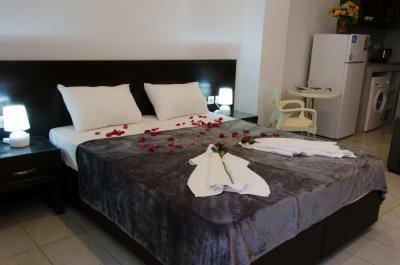 When would you like to stay at Polykratis Rooms? 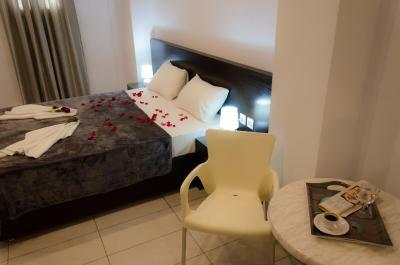 This twin room features a balcony, hot tub and tile/marble floor. This studio has air conditioning, electric kettle and tile/marble floor. This studio features a sofa, electric kettle and tile/marble floor. 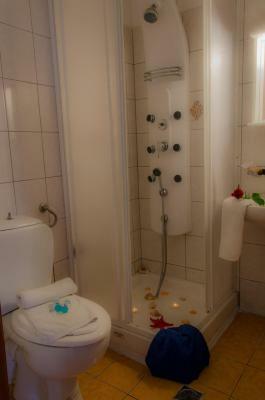 This double room has a hot tub, electric kettle and tile/marble floor. 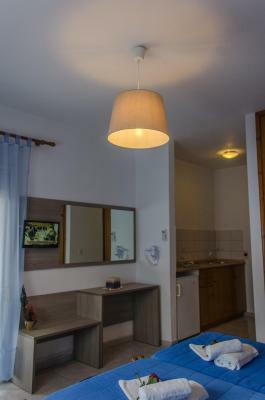 House Rules Polykratis Rooms takes special requests – add in the next step! 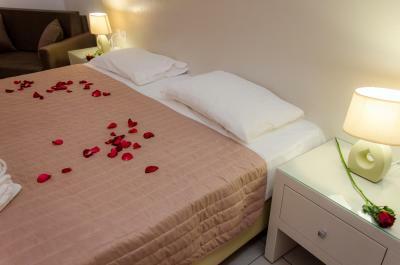 Polykratis Rooms accepts these cards and reserves the right to temporarily hold an amount prior to arrival. I tried once wifi but it did not work. Would be nice to have a bit more kettles and things for the kitchen. Furniture with sharp edges dangerous to hurt yourself! It was overrun by moths and the early check in I had requested didn't happen as the owners friends where still in the apartment when we arrived. Not good. Humidity in the room makes an unpleasant smell.